Figures from the Bank of Spain show that the amount of money invested by foreigners in Spanish property has fallen to the lowest level in a decade. If you want to chart the rise and fall of the Spanish property boom look no further than the foreign investment figures, published by the Bank of Spain. As you can see from the chart above, foreigners invested 3.7 billion Euros in Spanish property last year, the lowest level since 1999, when it was 2.9 billion. 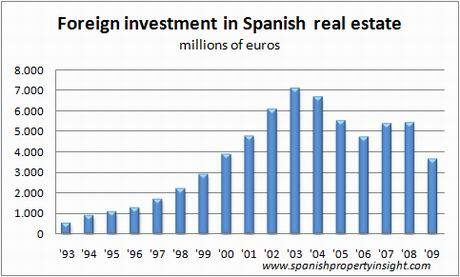 In percentage terms, foreign investment in Spanish real estate was down 32% last year compared to 2008, and by 48% compared to 2003, when foreign investment in Spanish property peaked. The surprising thing is the increase in foreign investment in 2007 and 2008, when the market was already cooling fast. This might have something to do with the massive corporate property investments that took place at decadent end of Spain’s property boom, before the credit crunch struck. Going the other way, the amount invested by Spaniards in property outside of Spain fell 45% last year to 1.8 billion Euros.